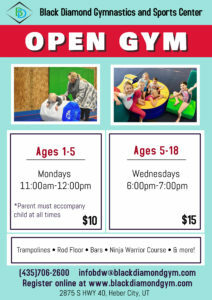 Open gyms are an opportunity for athletes to come and work out their skills in a safe environment or simply to have fun! While gym rules still apply, athletes are able to use all available equipment and play at their own pace. Coaches are present in the gym at all times and are free to help athletes with learning new tricks or perfecting old ones! Preschool open gyms always require parental assistance and supervision. Coaches will be present to assist parents in learning spotting techniques and to enforce gym rules. Diamond Membership athletes are welcome to come at no charge. Registration is available through our online calendar or through the front desk. Space is limited, so make sure to pre-register!